Its Friday so you know what that means, Twinsie Friday!!!! Can't wait to see my Twins post, if you don't want to miss it check it out at Nails Made Simple!!! 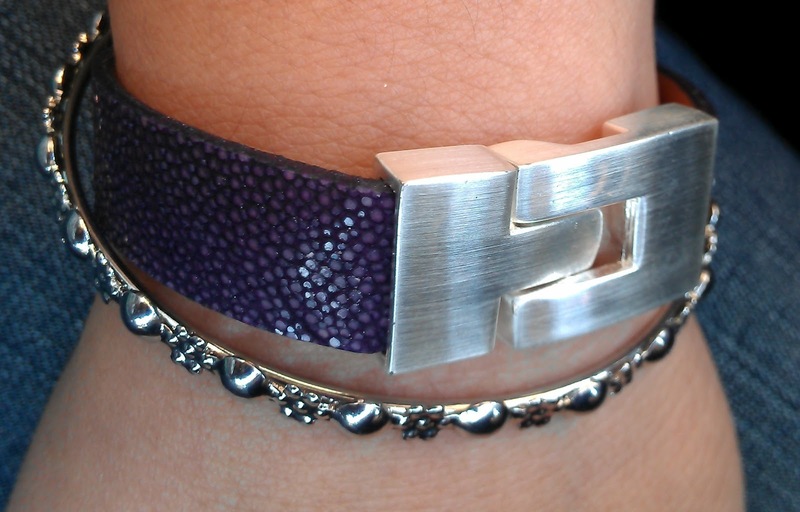 Love your bracelets, both this and the other one you showed. And yes, I like the layering very much as well. It's good to do somethig "simple" sometimes :) I think it's fun, kinda Dalmatian nails! It reminds me of salt and pepper too! I actually really like the combination! oooh i love this! asbestos looks amazing! I really like the combo. And it really does remind me of salt and pepper. I really like this, it's simple looks so pretty! you didnt do a poor job bish! 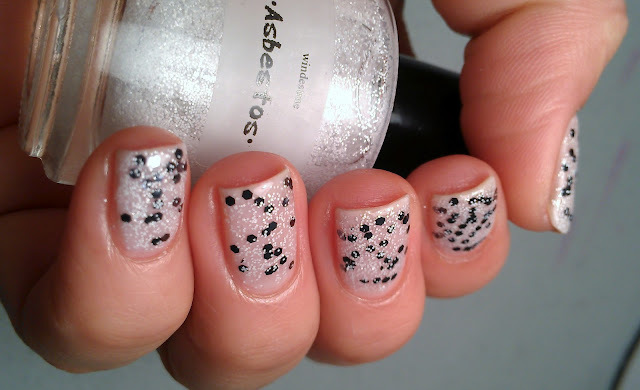 i love this mani,!! it reminds me of dirty snow ( in a nice way) :D and you bracelet whore !! 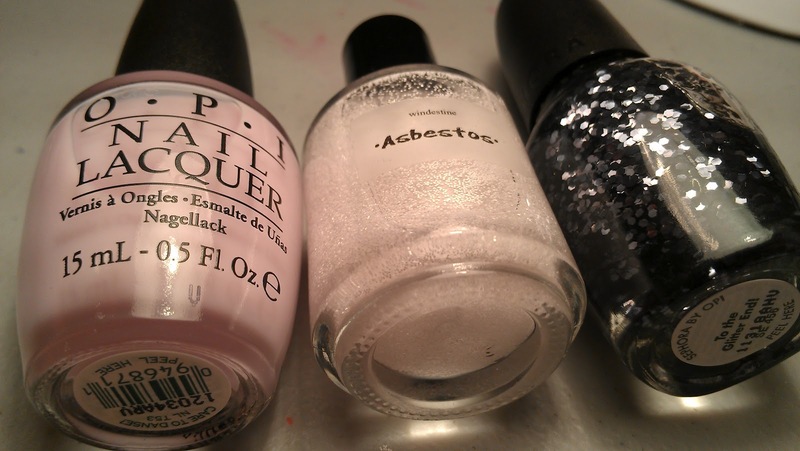 I really love that Windestine polish!! It's so unique I've never seen a polish like it!! I am digging that Asbestos! So cool! I love it! It looks like chocolate chip ice cream with glitter!! haha, really salt and pepper :). Very nice!! I like that it looks like salt and pepper! It's different and I like it! Sooo cute! I really like it! ooo this is cute! i love white/black glitters! So cute, does look like salt and pepper! This really looks like salt and pepper hehe. 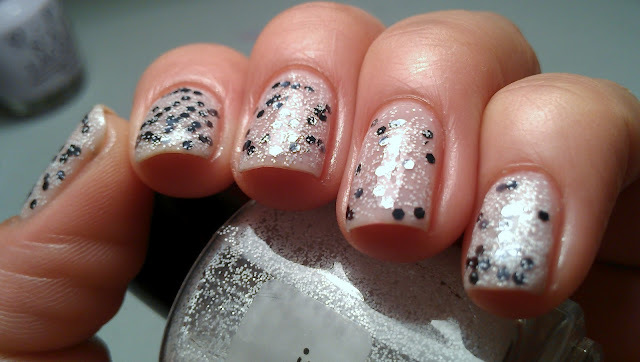 Love those glitters! Your nails look awesome! I love the dots. I little birdie told me today is your Bday!! Have a great day!!! En España, más que abrazos, damos un tirón de orejas por cada año cumplido. My sister forgot to do it, which is great because otherwise my ears would be swollen and bright red, lol. I don't think you did a bad job. It does look like salt and pepper, but in a good way. It's pretty! I'm not feeling the name asbestos though. What's that about? LOL!! Happy Birthday! Have a Great Day!!!!!!!!!!!!!!!!! I haven't seen that SOPI before--very interesting! And the Asbestos looks like snow to me--I might need that one.